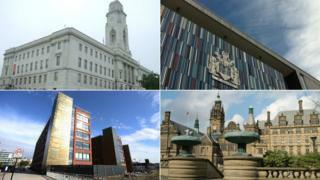 Political leaders in South Yorkshire say they have made a "breakthrough" on the region's stalled devolution deal. Sheffield City Region mayor Dan Jarvis and four local council leaders said they had "reached a consensus". This could allow the region to unlock funding and powers but would not prevent "wider Yorkshire devolution ambitions", Mr Jarvis said. The Ministry of Housing, Communities and Local Government said delivering the existing deal "remains a priority". The announcement comes more than three years after an initial deal was agreed. In October 2015 former chancellor George Osborne signed an in-principle agreement with local politicians which granted an elected mayor power over transport, strategic planning and skills together with £900m over 30 years. But in September 2017, the leaders of Barnsley and Doncaster council voted down the offer, instead backing a proposed 'One Yorkshire' deal. Despite extensive efforts to negotiate a broader deal the government repeatedly rejected those plans and urged council leaders to enact the South Yorkshire agreement, leading to an impasse. Mr Jarvis described the agreement as a "pragmatic solution" to unlock the Sheffield City Region deal while also supporting future devolution developments. He said a letter had been sent to Secretary of State for Housing, Communities and Local Government James Brokenshire outlining the proposal. This urged the government to grant access to the proposed funding "on the understanding that each authority is able to move to other devolution arrangements, should they wish to do so, in 2022". A government spokesman said: "The completion of the Sheffield City Region deal and delivering its benefits, including £900 million of investment funding, to local people remains a priority for government. "We have received a letter from the mayor and local leaders proposing a way forward which will now be carefully considered."